A little bit of easy math is all it takes to make sure your prints look their best. Resolution is one of the most commonly misunderstood concepts in digital imaging, though it’s crucial when printing your mementos. You could trudge through life without understanding resolution, and the Print dialog box in most apps and most online print labs alert you if you don’t have enough of it to print. However, mastering resolution enables you to figure out not only what size prints you can make from your pictures but also what the quality will be. Your digital pictures are made from thousands of tiny blocks of color called pixels. If you zoom far enough into a photo in an image editing app, you can see them individually (you’ll need to squint to see them in Photos as you can only zoom in to 200 percent). By zooming way into this photo (to 3,200 percent in Photoshop, to be exact), you can see the individual pixels that make up a tiny section of this sunflower. Contrary to popular belief, pixels have no predetermined size, which is where resolution enters the, uh, picture. 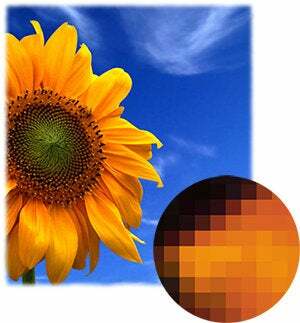 Resolution is the measurement that determines how many pixels get packed into a linear inch in an image, which therefore controls how big or small the pixels are. With that in mind, you may find it helpful to think of resolution as pixel size (though pixel density is more accurate). On your computer screen, resolution is measured in terms of pixels per inch in the U.S. (ppi, as folks typically call it); in most other countries, it’s measured in pixels per centimeter (ppc). Scanners and printers, on the other hand, refer to resolution as dots per inch (dpi). The higher the resolution of an image, the smaller the pixels. Small pixels make for smooth, high-quality prints. The lower the resolution, the bigger the pixels, which makes for blocky prints resembling a pile of Legos. Generally speaking, you need a resolution of at least 240 ppi to produce a nice print on most inkjet printers and online printing services. However, if you forked out big bucks for an inkjet printer that can spray ink at higher resolutions—say, 1440 dpi or 2880 dpi—you can sometimes get a better result by aiming for a higher resolution in your calculation. 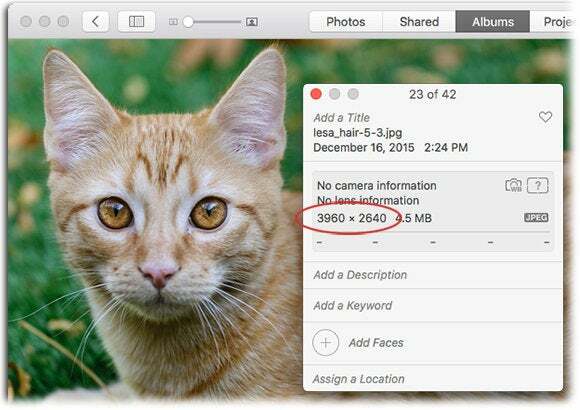 To keep things simple, Apple Photos won’t let you see image resolution, much less change it. Adobe Photoshop Lightroom doesn’t flaunt the setting either; you only encounter it when exporting images. Why? Because those apps calculate the resolution for you whenever you ask them to print an image at a certain size; if you don’t have enough resolution, the app tells you so. Other apps, such as Adobe Photoshop, Photoshop Elements, and Pixelmator also alert you to resolution deficiency in their print dialog boxes but they also let you fiddle with the resolution setting in their Image Size dialog boxes. If you don’t know what you’re doing, increasing resolution can trash an image because the app will add (interpolate) fake pixels that weren’t really captured. Now, this column isn’t about whether you should or shouldn’t change resolution or even how to do it in those apps. This column is about empowering you to calculate resolution manually using the image’s pixel dimensions and the size of the print you want to make. Doing so lets you know exactly what level of quality to expect from printing at a certain size. And if the resolution you calculate isn’t high enough to print at, say, 8 x 10 inches, then you can make an informed decision to print at a smaller size before wasting time and money. Besides, if you always shoot with the same cameras at the same quality settings, you only have to calculate resolution a few times to learn what print sizes you can expect to make from those devices. The first step in calculating what size print you can make is to find the image’s pixel dimensions and jot them down. In Photos, select a picture and press Command-I to open the Info panel. The dimensions appear in the second section of the panel. In Pixelmator, choose Window > Info Bar and the dimensions appear at the top of the image window. Pixemator displays dimensions in the Info Bar. In Photoshop Lightroom the dimensions are visible in the Library module in the Metadata panel. 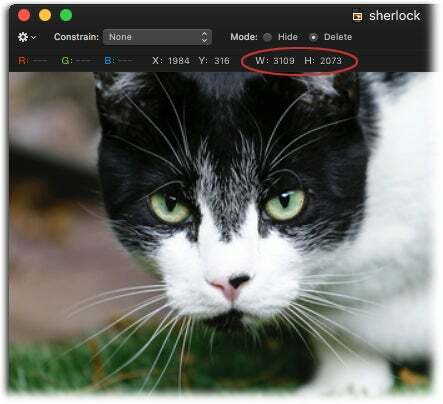 In Photoshop and Photoshop Elements, point your cursor at the Status bar at lower left and then click and hold down your mouse button to make the dimensions appear. The Status Bar in Photoshop (top) and Elements (bottom). 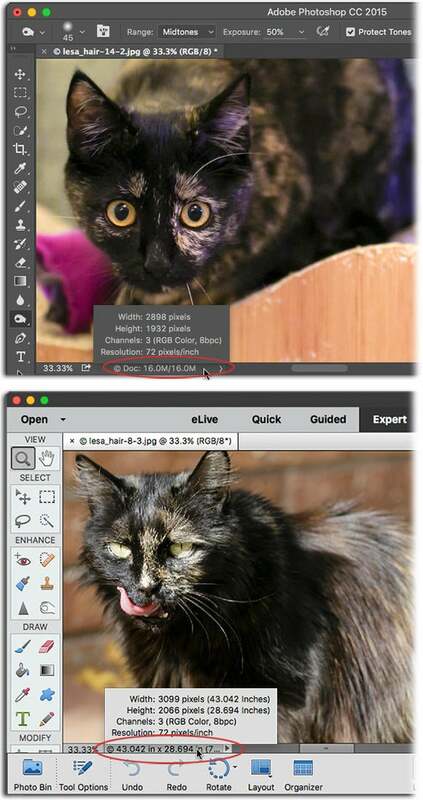 Next, open your Mac’s Calculator app and divide the longest edge of your image (measured in pixels) by the longest edge of your desired print size (measured in inches). For example, if an image measures 3,840 x 5,760 pixels and you want an 8- x 10-inch print, take the longest edge in pixels and divide it by the longest edge in inches of the target print size: 5,760 pixels ÷ 10 inches = 576 ppi. That’s more than enough resolution to produce an awesome print; remember, you need a minimum of 240 ppi though it really depends on the printer. However, if you want make a 30- x 20-inch poster out of that image, you’d have a resolution of 192 ppi (5,760 ÷ 30), which isn’t high enough to print well. Since big prints aren’t cheap, you’ll wisely decide on a smaller size and you’ll be more satisfied with the results. As you can see, all it takes to calculate print size is a little know-how and a little math. Until next time, may the creative force be with you all!